Discussion in 'B4J Tutorials' started by Erel, Nov 28, 2018. B4JPackager11 is a B4J non-ui program that builds a package with your app jar and an embedded modularized Java runtime. It works with OpenJDK 11 and B4J v6.8+. Lets start with the output. 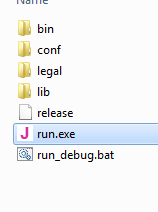 run.exe is the executable. run_debug.bat starts the program with a console that shows the program output. It also creates a template Inno Setup script in the parent folder which you can use to build an installer. On Mac and Linux it doesn't create an executable. It instead creates a bash script file that can be used to start the program. Directly from B4J - Start with this method. Just set the InputJar path and run it. - NetFrameworkCSC - Path to to the C# compiler which is part of .Net Framework. - IconFile - Path to the executable icon file (.ico file). - ExcludedModules - List of excluded modules. javafx.web is excluded by default. You need to remove it from the list if you are using WebView. - IncludedModules - List of included modules. Should be empty in most cases as the tool tries to discover the dependent modules automatically. Use forward slashes as I did above. You must build the package on the target platform. Windows - Java 11 should already be installed. Note that Java 11 is 64 bit only. - All files in the packager temp folder are deleted when it runs. - v1.02 - Configures the Inno Setup script to 64 bit. - v1.01 - Fixes a localization issue. hani bassam, ellpopeb4a, David Meier and 7 others like this. Would this work with the OpenJ9 JVM? This tool is designed for Java 11+. You should use the previous B4JPackager tool for older versions of Java. I am using Java 11 Open JDK. I am thinking of using the Eclipse/IBM JRE/JVM which is called OpenJ9. Is there any way to avoid the opening of the terminal in nix and MacOS when running the packaged app ?? I am thinking of using the Eclipse/IBM JRE/JVM which is called OpenJ9. I don't think that it includes the JavaFX modules. It will be difficult to add them yourself. The current implementation is indeed not perfect on Mac and Linux. It will be improved. Just as a note, Java 11 is only 64-bit, the ISS script generated is missing "ArchitecturesInstallIn64BitMode=x64" in the set up, so it goes for installation as a 32 bit application (Program Files x86). This is a very cool and useful feature, thx for it. There is one thing I observed on my mac. Though it works, the program is not running alone. Clicking on the generated run.command opens a terminal window and the program is started from there. This is not so elegant, can this be done differently? With Platypus you can very easily add all files and directories from B4JPackager11 into one program package. It also gives you the possibility to add a custom icon. I haven't done a lot of testing but it seems to work. So B4JPackager11 and Platypus = Stand alone application on OS X.